In this unit you will learn two fretted notes on the second string and articulations. ‘C’ is in on the third space of the staff. 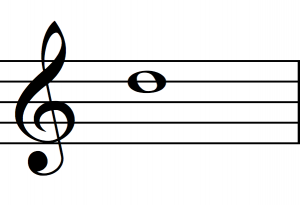 To play ‘C’, fret the first fret on the second string. ‘D’ is on the fourth line of the staff. To play ‘D’, fret the third fret on the second string. Articulations direct musicians to vary the emphasis of notes, and control the endings as well as the beginnings of the sounds. A phrase is a collection of notes that can be perceived as a coherent idea. Articulations alter one or more of the following aspects of a note or phrase: dynamic (loud or soft), duration (long or short) or relation to neighboring notes. Some of the most common articulations are described below. The tenuto is a straight line. It directs you to sustain the note for the full duration of its indicated rhythmic value, or even slightly longer. The accent is a sideways wedge. It directs you to play the note louder than its surrounding notes. The marcato is an upward wedge. It directs you to play the note even louder than a note with an accent mark. The staccato is a dot. It directs you to play the note shorter than its rhythmic value indicates, without speeding up. 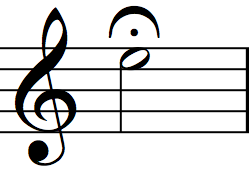 The fermata is a semi-circle with a dot in the middle. It directs you to sustain the note(s) for longer than its indicated value, and in accordance to your musical taste. 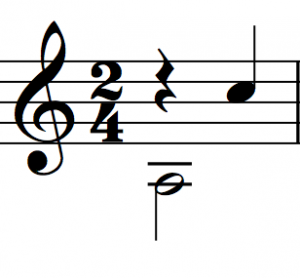 NOTE: Throughout this series, a note with a fermata symbol will be held for twice its indicated duration. 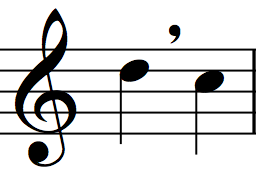 The mezzo-staccato (AKA portato or articulated legato) is a combination of a tenuto and staccato (over one note) or a slur and staccato (over more than one note). It directs you to play the phrase with a smooth yet pulsing articulation. The breath is a comma. It directs you to pause after its preceding note, without interrupting the flow of the tempo. 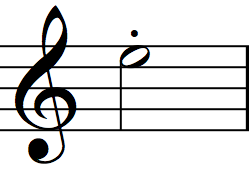 The slur is a curved line that connects two or more notes. It directs you to play legato. 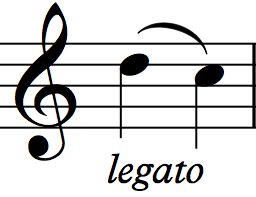 Legato means to play the notes as a smooth and connected phrase. Sometimes the word legato will appear below the phrase. The pull-off is a type of slur. It directs you to pluck the string to sound the first note of the group and pull the fretting finger(s) off the string to refresh string vibration for the remaining note(s) of the group. The word pull is misleading since to sound the second note, the fretting finger actually plucks the string, in a downward direction. 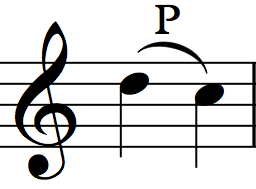 Pull-offs are usually implied when a slur connects a higher note to a lower note. Sometimes, the letter ‘P’ is placed above the slur. The hammer-on is another type of slur. It directs you to pluck the string for the first note of the group and hammer the fretting finger(s) onto the string to refresh string vibration for the subsequent note(s) of the group. Hammer-ons are usually implied when a slur connects a lower note to a higher note. Sometimes, the letter ‘H’ is placed above the slur. The guitar is one of the only instruments that can consistently play multiple notes at once. As a result, one guitar can produce different conceptual elements—such as a bass line, harmony and melody—at the same time. In some genres of guitar music—such as the fugues of J.S. Bach—one guitar can produce concurrent melodies. These different musical elements are referred to as voices. Music notation strives to convey distinct voices on one score by assigning down stems to lower voices (bass) and up stems to higher voices (usually the main melody). The practice of using stem direction to show different voices is meant to help guitarists make sense of the notated musical material. 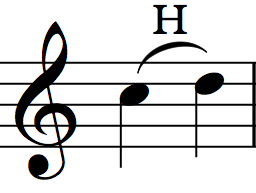 The notation above suggests two voices: a sustained bass note and a melody. Both parts are written in the same measure. The different stem directions set the voices apart. 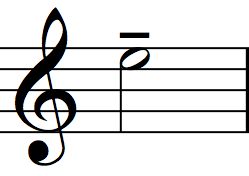 The down stem on note ‘A’ suggests it belongs to a sustained bass note. The up stem on note ‘C’ suggests it belongs to the melody. 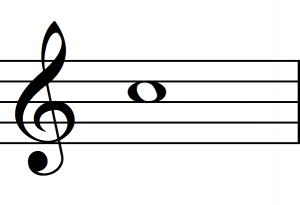 The quarter rest that precedes ‘C’ belongs to the melody too. Notice that each voice adds up to 2 beats. Cultivate a calm demeanor. It is normal to experience uncomfortable emotions while sight-reading, especially for beginners. Nervousness, frustration, anger, panic, confusion and shame are just a few of the many feelings that arise. Allow calmness to enter into this assortment of emotions, like a ray of light piercing a stormy sky.